Warner Bros. Consumer Products (WBCP) announced today a landmark year ahead for DC Comics and master toy licensee Mattel, led by programs in support of summer 2011’s Green Lantern from Warner Bros. Pictures. Under the terms of their ongoing strategic alliance, Mattel is granted unprecedented access to the complete breadth and scope of the DC Comics vault of characters, including Green Lantern and thousands of world-famous heroes and villains, such as Superman, Batman, Wonder Woman, The Joker and The Riddler. Mattel will also continue its successful lines based on Batman: The Brave and the Bold and DC Super Friends, and is in the process of developing an all-new line to support Young Justice. "The sheer volume of the DC Comics property portfolio lends itself to an incredible array of consumer offerings," said Brad Globe, president, Warner Bros. Consumer Products. "As master licensee, Mattel has consistently created innovative products that are true to the spirit of the DC Comics heroes and villains from which they are inspired. We look forward to seeing the results of the next wave of property collaborations." 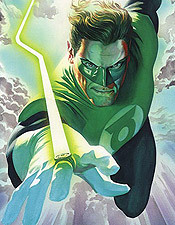 Green Lantern is set to light up movie screens around the world in summer 2011. Bringing the enduringly popular DC Super Hero to the big screen for the first time, Green Lantern stars Ryan Reynolds in the title role as the newest member of the Green Lantern Corps. Each Green Lantern wears a ring that grants him superpowers, but when a new enemy threatens to destroy the balance of power in the Universe, their fate, and the fate of Earth, lie in the hands of their newest recruit, the first human ever selected: Hal Jordan. "The Green Lantern film has an incredibly wide merchandise appeal," said Donald De Line, Producer, Green Lantern. "The potential is there for amazing toys and merchandise because Green Lantern’s ring can create anything the imagination can conjure. From space stations and vehicles to alien action figures, the possibilities are just endless." Mattel is launching a rich and comprehensive line of products based on the film for both kids and adult fans alike. The multi-category toy line includes Basic and Deluxe Action Figures, Figure/Vehicles, Role Play, Playsets, Games, Puzzles and Vehicles. Additionally, each Action Figure toy comes complete with a Green Lantern ring in order for kids to feel as if they, too, have been "chosen" to be a Green Lantern. The Deluxe Action Figures have a special feature that allows kids to truly replicate the elements in the film, and come with accessories that unfold into completely different items for unlimited hours of play. "Mattel’s Green Lantern toy program is going to introduce Green Lanterns like Hal Jordan and Kilowog to new fans everywhere," said DC Entertainment chief creative officer and Green Lantern co-producer Geoff Johns. "It is going to be amazing to watch the world discover the Green Lantern mythology." In order to fully realize the potential array of Green Lantern offerings, Mattel is supporting the film across key Mattel Brands such as Hot Wheels®, Tyco® R/C and UNO®. Collectors will also be pleased to discover that Mattel is releasing a Green Lantern "Movie Masters®" line of highly detailed figures based on the film, which are sculpted by the "Four Horseman" design team. Mattel’s Green Lantern product lines hit retail in summer 2011. "We have a fantastic global partnership with WBCP and we’re thrilled to be working with them on the release of their next super hero blockbuster film. The beauty of Green Lantern is that he is an inspirational super hero with a rich, unmatched heritage that will appeal to boys of all ages. Adult collectors will be attracted to our highly detailed line of action figures and boys will be attracted to our playsets, role-play toys and vehicles because of the innovation infused throughout the entire line," said Tim Kilpin, general manager, Mattel Brands. Mattel is also rolling out products inspired by Young Justice, which will premiere on Cartoon Network during the 2010-2011 season. This all-new series is produced by Warner Bros. Animation and is based on characters from DC Comics. Featuring a team of teenage heroes, the show brings the popular comic to the small screen with favorites including Robin, Aqualad, Kid Flash, Superboy, Miss Martian and Artemis. Product offerings from Mattel include figures, playsets and other show-inspired lines. Batman: The Brave and the Bold fans can prepare for the release of "Total Armor" toys based on the popular Warner Bros. Animation series airing on Cartoon Network. "Total Armor" means Batman and his allies will be equipped with additional, new weaponry and high-tech gadgets. For example, "Magma Armor" Batman will feature a detachable water blaster with storage tanks. "Tank Blaster" Batman comes with industrial armor styling and a massive cannon with multiple projectiles. Even the "Total Armor" Batmobile is getting upgraded with armored plates and two projectile-firing launchers. Additionally, all figures and vehicles will still have sockets in order to increase the customization ability by kids. Mattel will also offer Role Play items including the Telescoping Battle Sword and Batman’s Utility Belt. Items in the "Total Armor" line will be available in spring 2011. Mattel and Fisher-Price are continuing to experience tremendous success with the popular Super Friends line of products created for boys ages three to eight. Building on a successful 2009, Fisher-Price has developed new motorized vehicles, figures and playsets, including the all-new Imaginext® Joker’s Fun House and building sets from TrioTM. The Fisher-Price Smart Cycle®– a stationary bike, learning center and arcade game system – will offer Batman and Green Lantern titles. The iXLTM Learning System, a 6-in-1 portable smart device, will feature the Batman: The Brave and the BoldTM software title. These products will be available this fall. Additionally the Power Wheels® brand is in on the Super Friends action with the BatmanTM, Lil’QuadTM and BatmanTM Lights & Sounds Trike ride-on vehicles, which are available now.